In the highly competitive restaurant game, it’s not unusual to see crows circling, metaphorically speaking. However, despite the heat, Damian Husted is no Gordon Ramsay in the kitchen. Instead, the talented head chef at Auckland City’s fashionable Scarecrow restaurant prefers to maintain a steady hand, and temper. “Some chefs have become famous for being aggressive, abusive and angry. No one performs at their peak when being screamed at, nor can a love of cooking be developed in such an environment,” he explains. This approach has served Damian well, from earning him an extra small sized chef’s jacket (aged 13) to taking on his current role last year. Bulgarian-born and Danish-raised, Damian moved to New Zealand in 2005. He has worked at such acclaimed restaurants as Bracu, DeBretts Kitchen and TriBeCa. Aside from some recent studies in food science and biology, he has had little in the way of formal culinary education. Ironic, considering his parents’ shared occupation. They are both business professors at the University of Auckland. “I have been ‘lucky’ to attend a lot of academic events throughout my parents’ careers, such as conferences, dinners and inaugurations. I think that was a contributing factor to my diminished curiosity towards academia,” he laughs. However, Damian asserts an education in the culinary sector is essential for some and does not consider his own skills to be ‘self taught’. Instead, he believes that we all draw on the knowledge of others. He rates his parents as his most influential mentors. From his early days at Copenhagen’s Olsen restaurant – where Damian had to stand on a bucket to reach the broiler! – the inquisitive cook became ‘addicted’ to preparing quality cuisine. “There wasn’t any one thing that made me decide to be a chef. It was all kind of addictive. The smell of the overnight braise and the chef’s cigarettes, along with the ‘danger’; adrenalin and pressure made an addictive combination I found very difficult to escape. 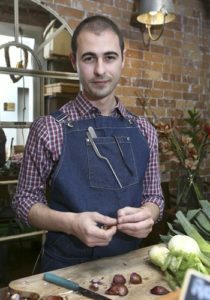 Since taking the reins at Scarecrow (which operates as both a restaurant/cafe and market rolled into one), Damian’s enthusiasm for fresh ingredients and an ethical approach has grown. He says the atmosphere, produce and passion are fantastic. For New Zealand to establish its place on the world stage as a purveyor of fine dining, local chefs and customers must embrace fresh, seasonal ingredients from our own backyard, Damian says. “Although some products improve with age, most deteriorate, so [chefs] rely heavily on our growers and farmers. But, the only way to truly control freshness is by growing, killing and foraging our own produce. It also gives us a higher appreciation for the sacrifice of life behind each plate and increases our respect for nature. Restaurant kitchens are not a place for the faint of heart. The heat, the intensity, and the noise are enough to give any novice chef the blues. Established to nurture emerging talent, the Blue Apron Collective (baC) helps apprentices develop their skills alongside seasoned professionals. “I started baC in 2014 when, lacking a creative outlet for my own food, I became convinced there were others that had the same passion and desire to challenge the public with our food,” Damian explains. Through a variety of initiatives, including pop-up restaurants, baC provides budding chefs with opportunities to learn from their peers while taking their talents to the streets.